Why not try something a little different this year for Thanksgiving? Our smoked turkey recipe starts out with a super simple dry brining process using our Kansas City Southern Seasoning blend. 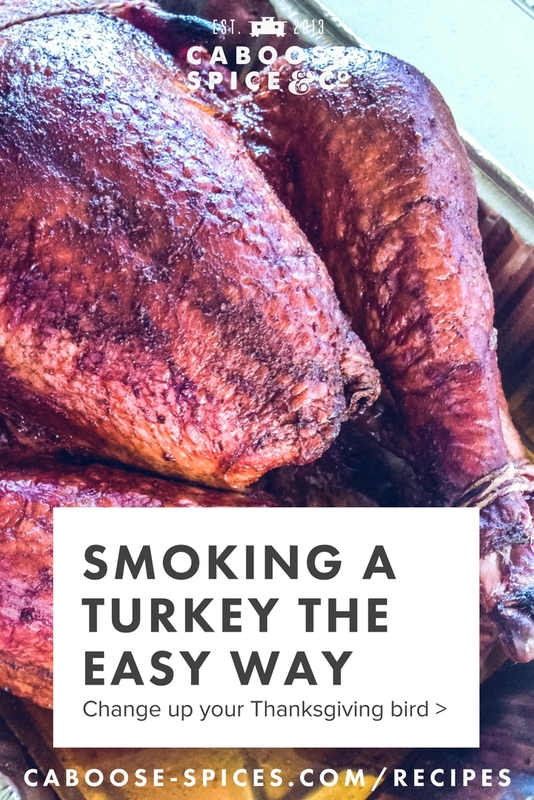 We use our Traeger grill to smoke and roast our turkey, but you can follow the same process with a simple smoker box on your grill and finish the roasting in your oven. Why deal with the mess and hassle of a wet brine when you can skip the water (and the mess) and dry brine instead. Not only is it easier, but dry brining results in a purer turkey flavor because its juices aren't diluted with water. Instead of adding water to the turkey the way a wet brine does, the dry brine increases the turkey's tenderness and helps it remain juicy without watering down its natural flavor. We used our Kansas City Southern All- Around Awesome Seasoning & Rub as our dry brine, though you can simply use Kosher salt. Kansas City Southern not only contains the Kosher salt used in a dry brine, but also adds hints of smoked paprika, cumin, cayenne, and other delicious spices to make the best tasting turkey you’ve ever eaten. The morning of Thanksgiving (or whenever you decide to enjoy your delicious smoked turkey), we’ll remove the bird from the fridge, truss with kitchen twine or cotton string, and brush with olive oil. This will keep the skin nice and moist while it smokes. We love apple or pecan smoke, or a combination of both. We let our bird smoke for 3 hours to get that nice smoke ring. Next, we’ll place the turkey in our aluminum roasting pan, and roast it at 350 degrees for 3-4 hours. Roasting time will largely depend on the size of your turkey, so that’s why we use a roasting thermometer to monitor our turkey’s internal temperature. You’ll want to measure the temperature at the inside of the thigh (not touching bone) and wait until it reaches at least 165 degrees. I like to call it done when the temp reaches 170-175 just to be safe. We use the Taylor 1470N Digital Cooking Thermometer with Probe and Timer, and we love it! Then, we let the turkey rest, uncovered, for 10-20 minutes before carving. Covering or tenting with aluminum foil will take the skin from crisp to rubbery, and we don’t want that! Rinse the turkey and remove giblets. Pat dry with paper towels. Rub all over with Kansas City Southern. Wrap tightly in parchment paper or plastic wrap, place in aluminum roasting pan, and refrigerate overnight. Set your Traeger grill to smoke and open lid until fire is established. If using a smoker box or traditional smoker, prepare a pan of chips and set to smoke. Remove the turkey from the fridge. Discard the parchment or plastic wrap. Truss the turkey with kitchen twine (click here for instructions + photos). Trim the ends of the twine with scissors. Set aluminum roasting pan aside for roasting. 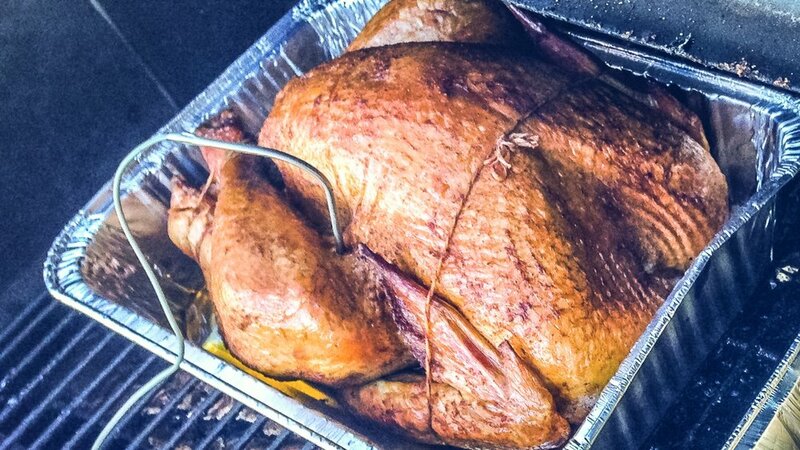 Place the turkey on the smoker grill and smoke for 1 hour. Brush again with olive oil, and smoke for 1-2 more hours, for a total of 3 hours on smoke. Preheat grill or oven to medium heat or to 350 degrees.Transfer smoked turkey to aluminum roasting pan. Insert roasting thermometer temperature probe in the thickest part of the thigh (not touching bone). Place turkey and roasting pan in the grill or oven, connect the temperature probe, and carefully close the lid. Set probe temperature to 170. Roast for 3-4 hours, or until internal temperature reaches 170 F.
Let turkey rest, uncovered, for 10-20 minutes before carving.